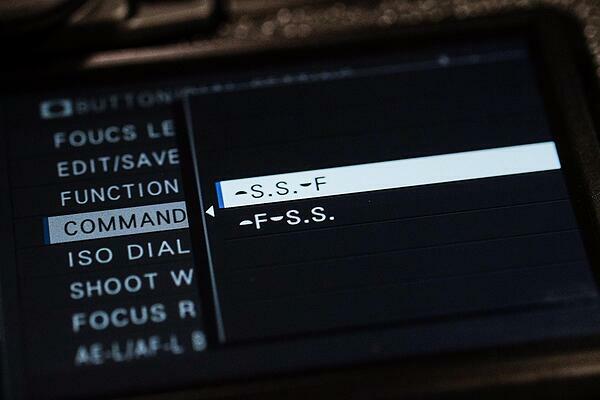 When you first purchase your new Fujifilm X-Pro2 there’s a few settings you may like to change to personalise your shooting experience. The new menu design is constructed by grouping together similar settings under 6 shooting menus, a set up menu and a customisable My Menu (pictured below). 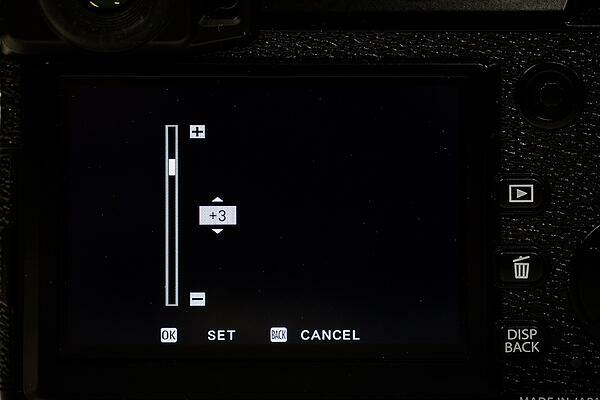 If you’re coming from a different camera system you may find the button configuration and dials to be different on the X-Pro2. Fujifilm have listened and like on models before it the X-Pro2 can be customised to suit your photography shooting style. The first setting you may wish to change is the operation of the command dials. These two dials, one located on the front and the other on the back of the camera, will be used extensively when photographing in aperture or shutter priority and manual mode. They will also have other functions when used in different modes, but shooting modes is what they’ll mainly be used for. Shutter Speed (S.S.) located at the front Command Dial with Aperture (F) adjustable on the rear Command Dial, or alternatively, Aperture on the front dial and Shutter Speed on the other one. Make sure you test out both options so you know what button configuration feels more natural when photographing. Something else you may want to investigate is the way you manually focus. In the same menu, just a few steps down choose ‘Focus Ring’. Once selected you can either change your focus direction from clockwise to counter-clockwise. 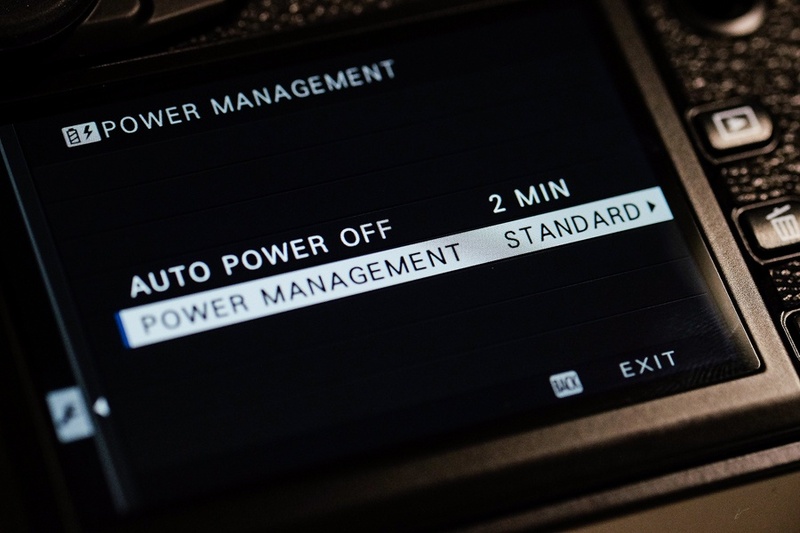 Power is something you may wish to manage on your Fujifilm X-Pro2. We’ve talked about the different number of shots you can obtain in a previous article here. 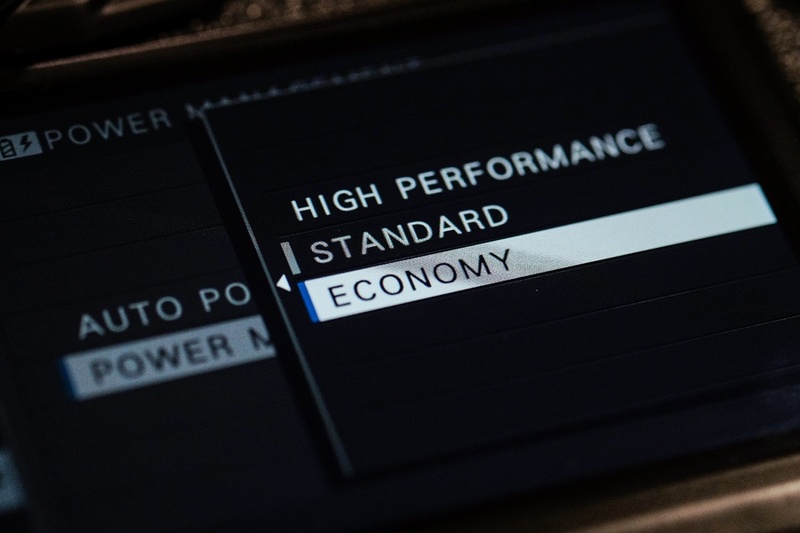 It’s recommended to stay with the default ‘Standard’ setting as focus performance will be better, however if you find yourself in a situation where you’re not near power (and you don’t have a spare battery) then selecting ‘Economy’ will be the best option. Once selected this mode will provide extended battery life. Something to note when using this mode is your focus will become slightly slower. This is a small downfall to bear with, because on the plus side you might be able to capture one extra photo that might not have been possible due to a depleted battery. Digital cameras have been out for quite some time and being a photographer, you’re bound to have a few in your camera bag or on the shelf. 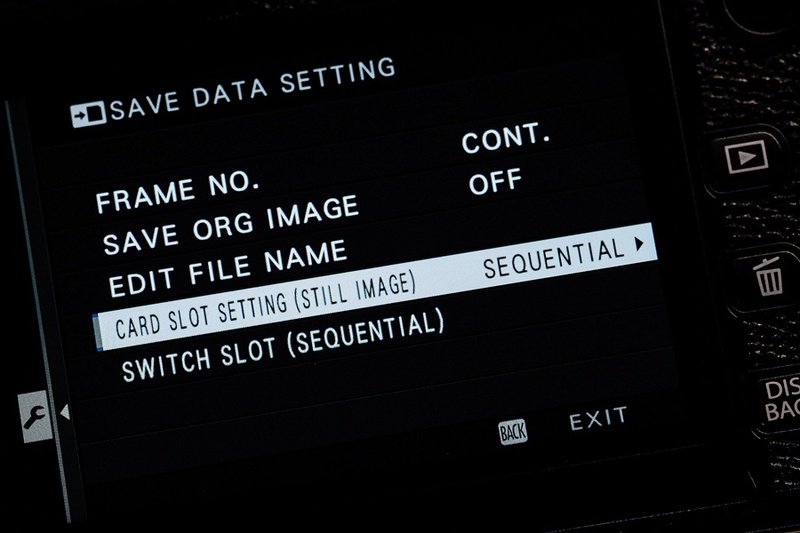 What this typically leads to is hundreds or thousands of RAW or .jpeg files on your computer that may require clicking on in order to view what they are or what camera captured them. Once you get to the screen above navigate to the next menu (shown below), here you’ll be able to select from two colour spaces - ‘sRGB’ or ‘AdobeRGB’. 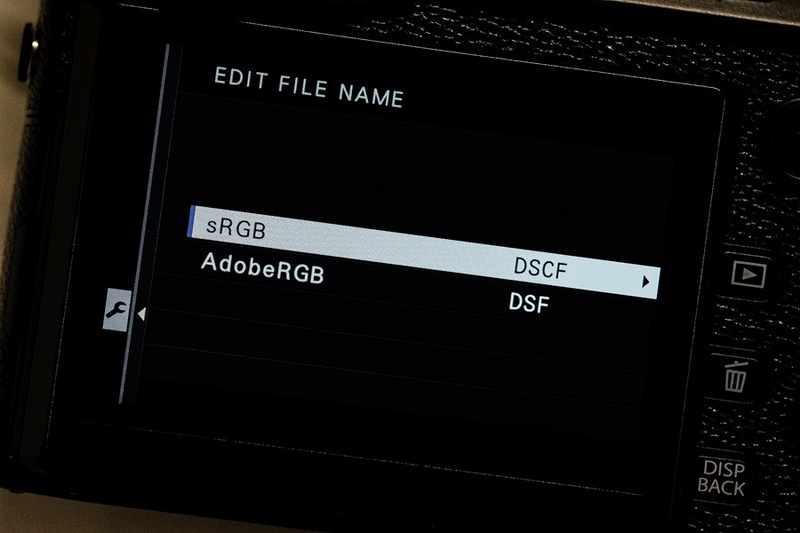 If you’re unsure what colour space to edit the file name for, then we recommended staying with sRGB as this is what you’ll be shooting with as a default. AdobeRGB might be worth setting up at the same time in case you wish to photograph with this colour space due to its wider colour gamut (ability to capture more colours). 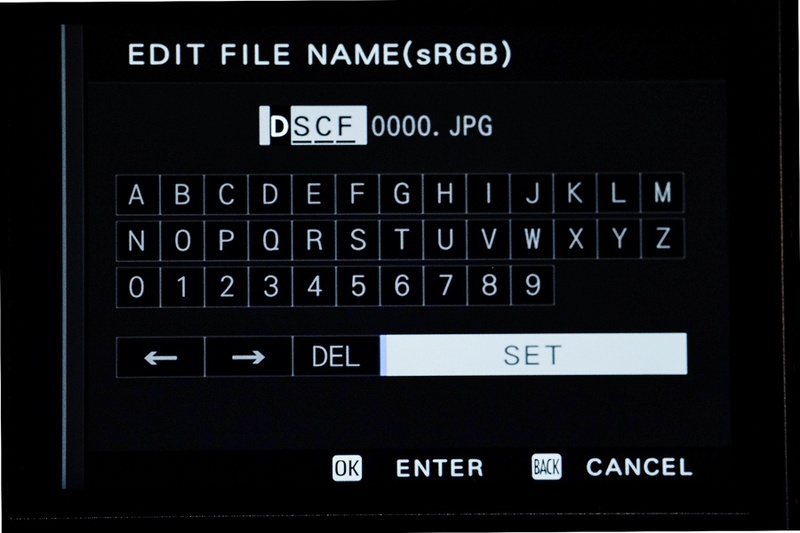 On the next screen (shown above) you’ll be able to select from individual letters and numbers to form a unique file name. These four characters will form the start of the file name. A good example of a file name customisation would be for a wedding photographer. The example above could be used to symbolise Jane and Adam’s wedding shoot. WJAA would stand for ‘Wedding’ “Jane’ ‘And’ ‘Adam’. The date and time would also be captured along with the file name. 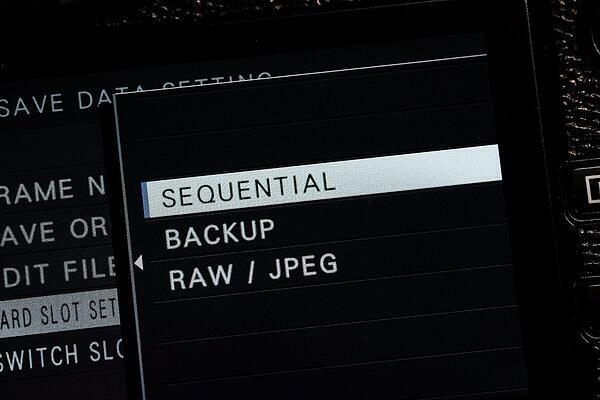 Now select from either Sequential, Back Up or RAW/Jpeg. If you’re an event photographer covering a fast paced sporting event, choosing ‘Sequential’ could prove to be the best option. Once one memory card is full the camera will automatically switch over to the next memory card and continue recording. The advantage is that you don’t have to remove your memory card avoiding missing possible photo opportunities. ‘Back Up’ could be handy if you’re a wedding photographer. The thought of losing a memory card or formatting one with someone’s precious lifetime memories would be enough for you to choose this option. Once selected, you’ll be able to record one image onto two memory cards therefore saving you the backup time after the wedding. Lastly RAW / JPEG mode could well be suited if you’re photographing for a client who requires the images while you’re on location. 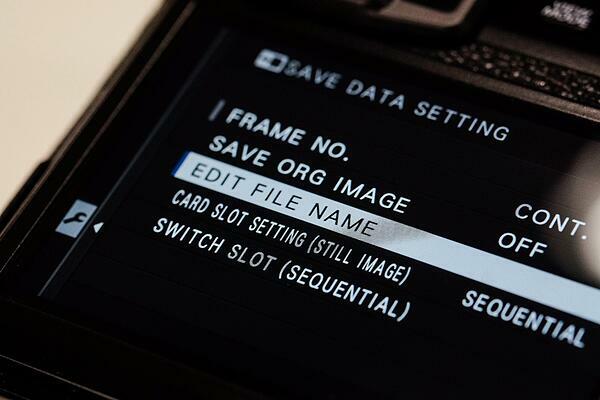 Selecting this mode will enable you to record RAW images on one card and JPEG files on the other. After the shoot, you can remove one of the memory cards and give it directly to the client. 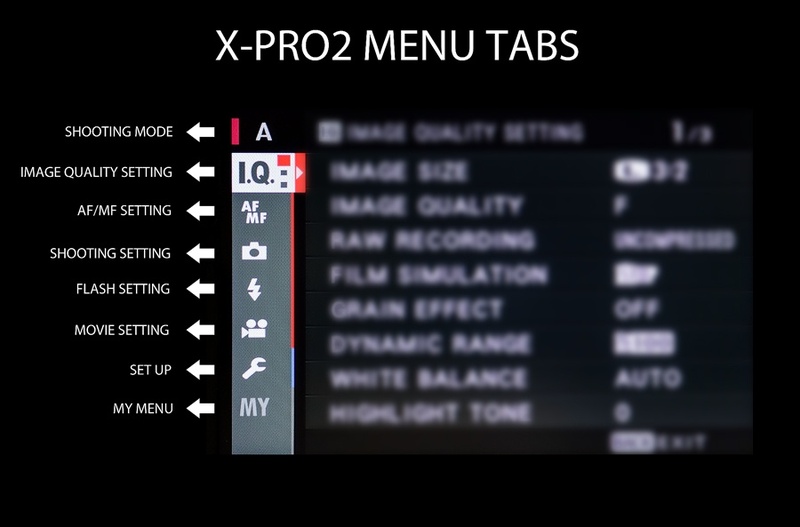 If you want to add a different look to your photos you may like to try this new X-Pro2 setting. A Grain Effect can now be added to photos either before you capture the image or after you record the photo when shooting in RAW mode. To apply the Grain Effect after you’ve taken the photo, navigate to RAW Conversion in the play back menu. Once Grain Effect has been selected it will open up two applied options. Choosing either ‘Strong’ or ‘Weak’ will overlay a template Grain Effect onto your photo that will mimic film. It’s recommended to experiment with this setting when using Film Simulations like Acros. 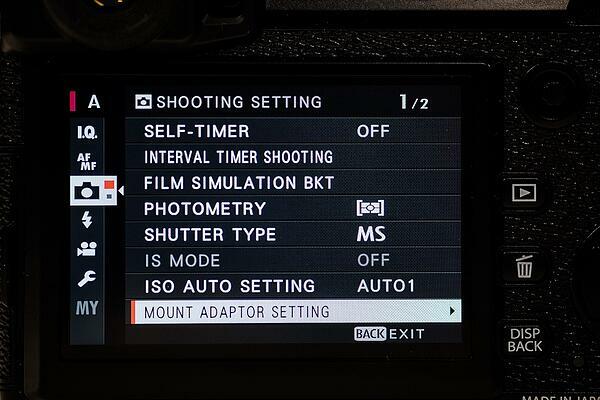 With this custom setting you can either register your unique lens profile or adjust the frame brightness of the Advanced Multi Hybrid View Finder. 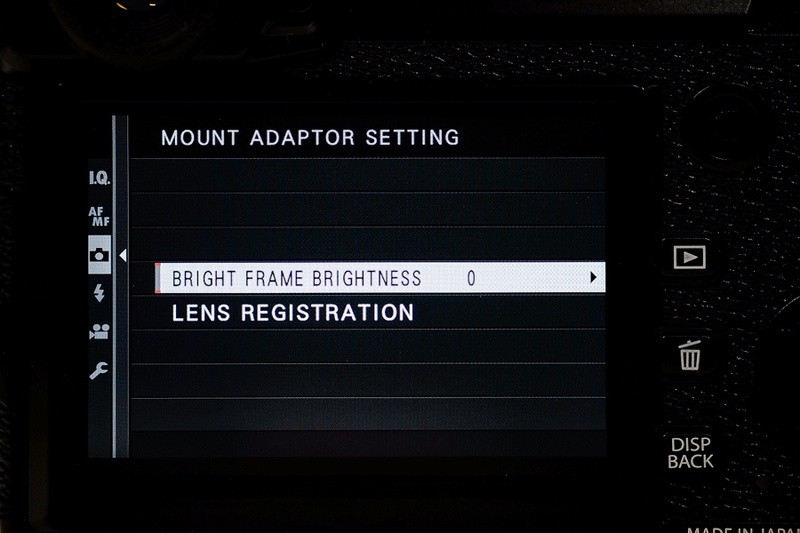 Select ‘Bright Frame Brightness’ and the camera will prompt you to look through the viewfinder and adjust the view finder brightness to either +5 or -5. 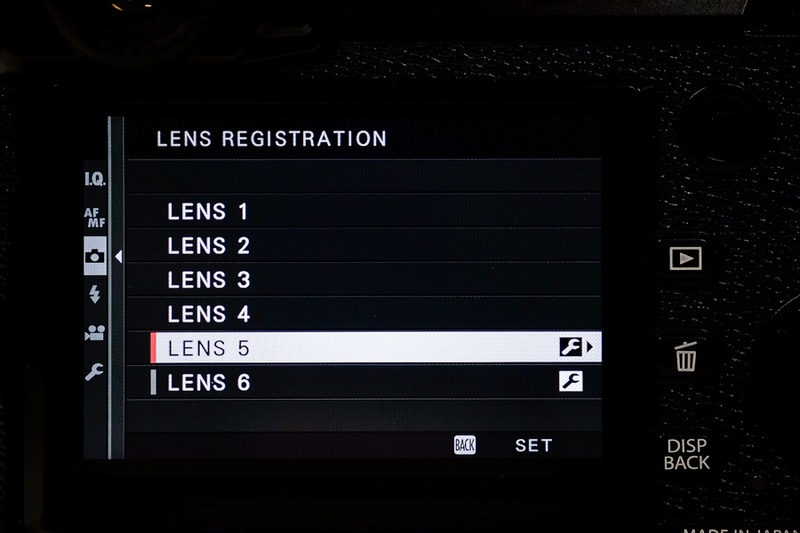 Selecting the ‘Lens Registration’ option will open up the following lens modules that can be programmed. In this case we are changing ‘LENS 5’. 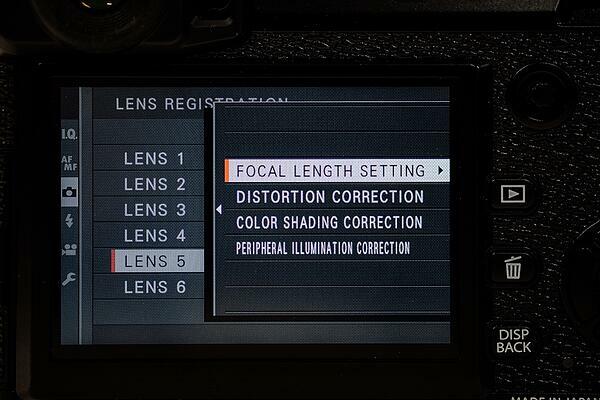 Following the lens registration setup to the next stage, you can see the following adjustments can be made; Focal Length Setting, Distortion Correction, Color Shading Correction and Peripheral Illumination Correction. 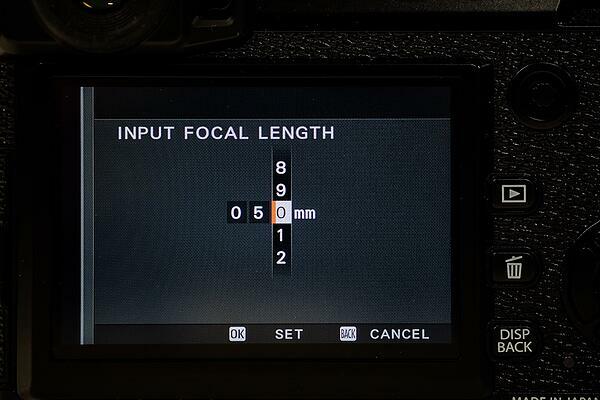 All you need to do to change the input focal length is dial in the lenses focal length using the three numerical number columns. 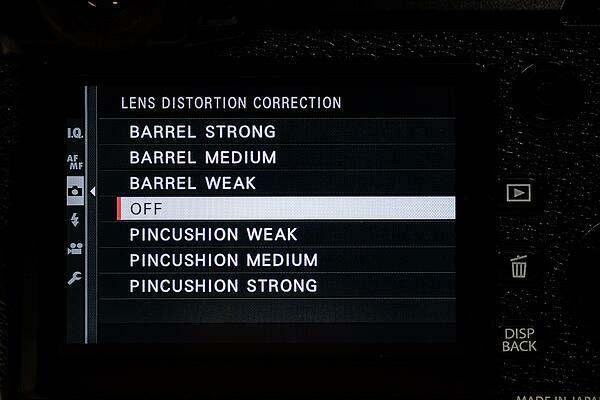 In the next menu option you’ll have the opportunity to correct any lens distortion. The options include changing the Barrel Distortion to Strong, Medium or Weak. The same can be said for Pincushion Distortion. A good example of this is if you have a photo that looks distorted on the outside edge (barrel distortion) then choosing Pincushion in the menu will correct any outside edge distortion in your frame. 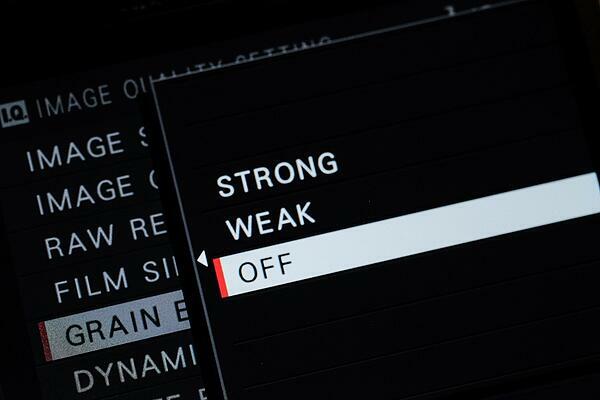 Simply select weak, medium or strong depending on how much distortion correction is needed. Once you have any distortion corrected, use Color Shading Correction to adjust any colour differences you may see in the corners of your photo. 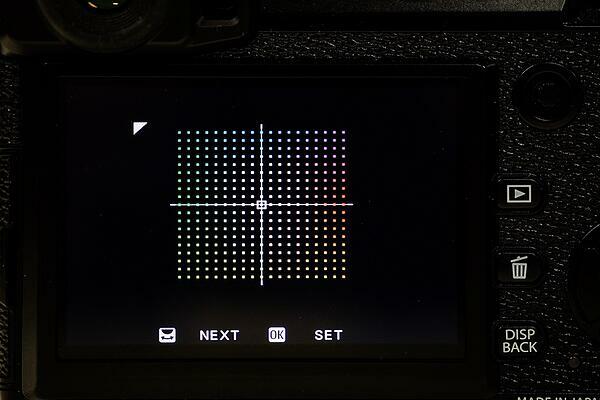 Typically, when adapting third party lenses on the X-Trans CMOS III sensor you may find there could be a difference in the light levels in the corners of the image when compared to the centre of the frame. This generally happens when the flange-back distance (17.7mm on the X-Pro1) is changed due to a third party lens being used (with an added lens adapter). Increasing the distance between the lens and the sensor (or changing the flange-back distance) can alter the light ‘intensity’ of a lens. The result can lead to a cast or darkening of the colour in the corners of your photo (when compared to the centre of the frame). Adjusting the colour shading can correct this, but please note it will be different on each third party lens you use. Fujifilm X-Series lenses don’t need to adjust Colour Shading Correction due to a set flange-back distance that has been calculated and calibrated for optimal optical performance across the complete line up of X-Series lenses. 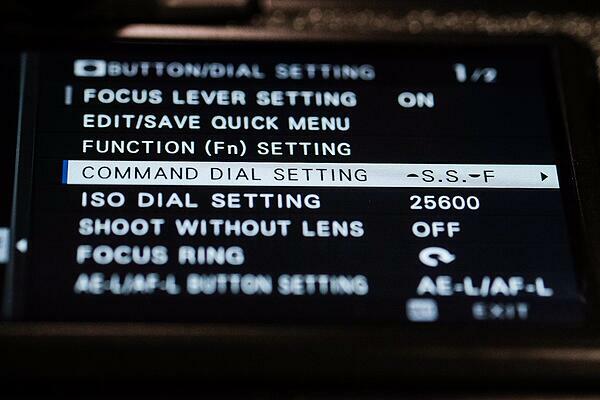 This is the reason why you’ll find this setting disabled when a Fujinon X-Series lens is used. Lastly, when using a third party lenses you may find you need to correct the darkening or lightening of the corners of the frame that can be present in your photo. 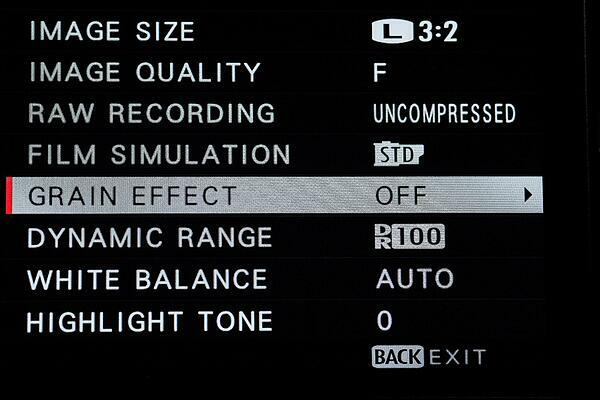 Changing the Peripheral Illumination Correction setting to either +5 or -5 will adjust this. To put it simply, this setting will correct the overall brightness of the image to make the corners of the frame uniform with the centre. The most common Peripheral Illumination Correction that will need to be made can be seen when a third party wide angled lens is used. This is because there will be some light fall off in the corners, which will cause dark corners to appear in the frame. If this happens, just experiment with different strengths of Peripheral Illumination Correction while taking photos of either a white wall or clear sky. You’ll know when you have the best setting when you can no longer see dark corners in the photo. If for some reason the third party lens has very bad peripheral illumination then using post processing software to correct the issue combined with the in-camera correction may be the best option. 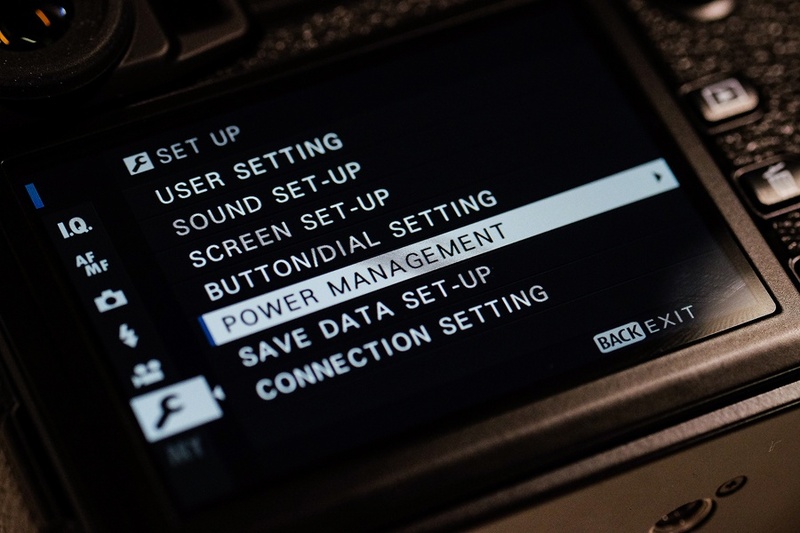 These settings mentioned are some of many that can be changed to customise your shooting experience when you’re out and about with your X-Pro2. 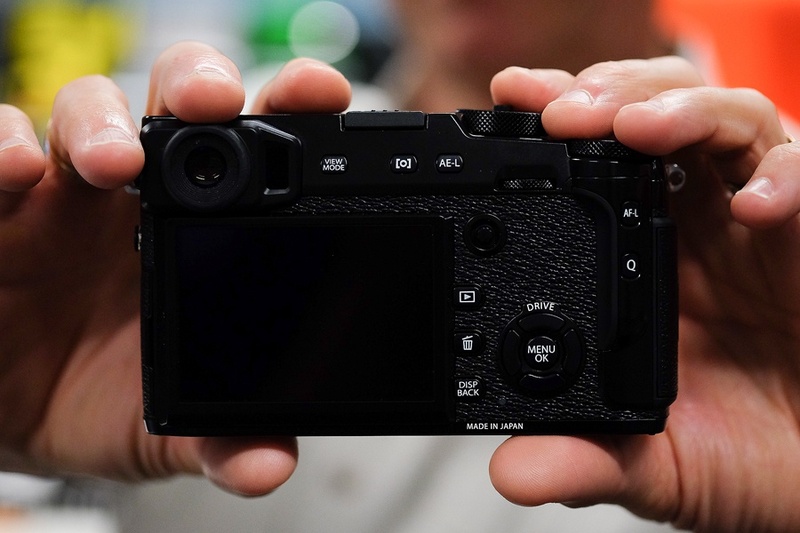 Fujifilm have really listened to your feedback to make this camera the best it can be. We hope you enjoy taking photos with your X-Pro2 camera, and please let us know if you have a favourite setting that you can’t wait to explore. We’d love to hear from you.